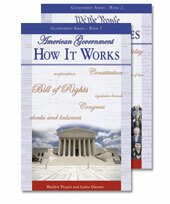 Learn the levels of the American government, the branches of the federal government, how courts work, how laws are made, and how immigrants become citizens. Two books written at a readability level of 3.5, one workbook, and a Teacher's Guide with answer key. Struggling readers and English language learners can now easily access American history from the colonial era through 2005. 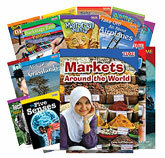 Four books written at a readability level of 3.5, two workbooks, and a Teacher's Guide. Books in the Extreme Nature series reveal examples of some of the most bizarre, amazing, and extreme events in the natural world. These interactive tales of life-and-death adventure give readers the chance to choose the plot twists and ending to each story. In the process they learn about survival techniques for dangerous situations. 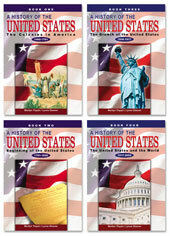 Leveled Texts for Social Studies is a resource designed to help all students grasp important historical people and events through high-interest text written at four different reading levels ranging from 1.5 to 7.2. The world is a shell of its former self. Most of the world's population is gone. You're one of the few lucky survivors, but can you trust the people that remain? Or will you face the bleak future on your own? Offer a fun and natural progression in reading with colorful books that feature content from TIME for Kids, and science and social studies themes. Children will want to read these books that include familiar concepts, informational text, and a variety of colorful graphics. Prepare readers for more challenging text with these books that are sure to motivate even the most reluctant reader. 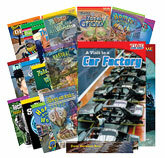 Each book introduces new vocabulary, diagrams, and graphics combined with informational text. 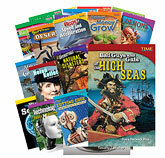 Provide a transition to upper level reading and motivate discovery with inspiring science and social studies topics. 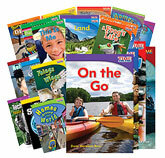 Each book features TIME for Kids content with informational text, and high-quality photos and graphics. Get them excited about reading with inspiring content-area topics they'll want to learn about. Each book features engaging layouts, TIME for Kids content, high-interest photographs, informational text, vocabulary, and sidebars. 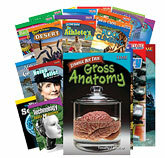 Be amazed at these nonfiction books featuring engaging TIME for Kids content. 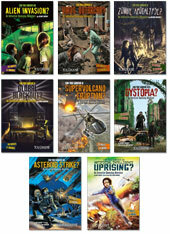 These high-interest books are designed to help build comprehension skills with cross-curricular content, challenging informational text, and key vocabulary.